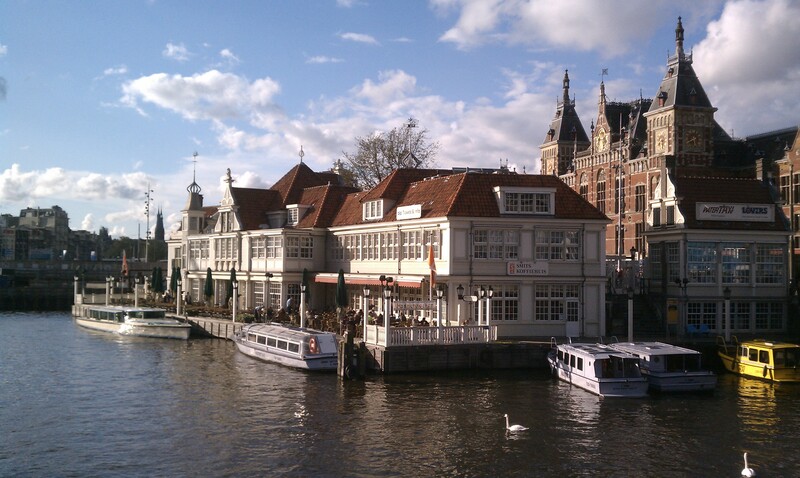 I just got back from a trip to Amsterdam and Germany, to attend the SieMatic Haus Fair. It was a whirlwind trip, with lots of rail travel and some side explorations. Its easiest for me to fly into A’dam from Philadelphia, and then work my way over to Bielefeld Germany where the SieMatic factory is. 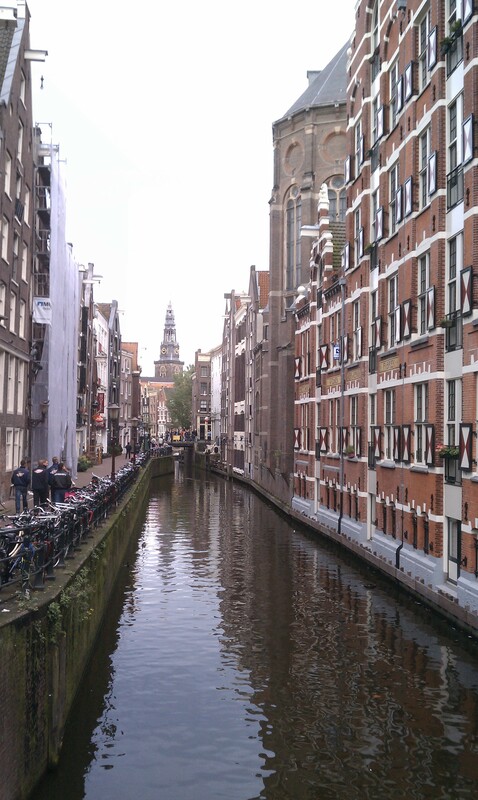 A canal near the red light district. Note the old industrial building wall is one-and-the same as the dockside. 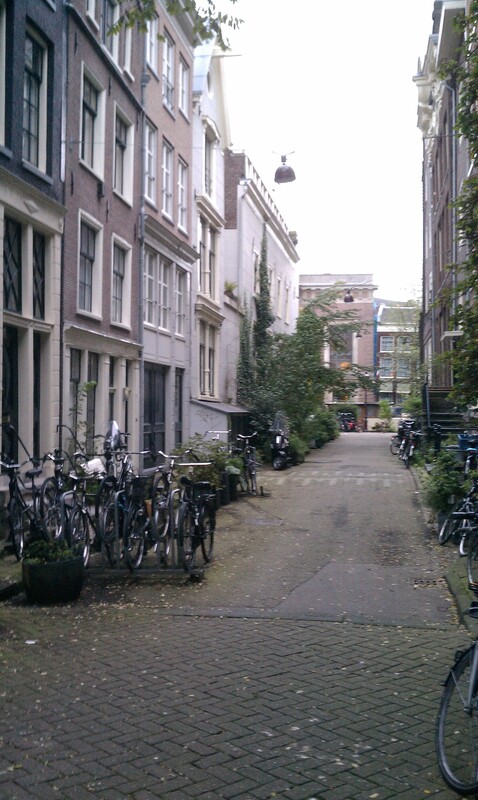 A lovely little side street in A’dam. Some things which are unique are the black-painted brick facades, the narrow sidewalks (often filled with plantings – but note this street does not have sidewalks at all) and paving stones on the roadway. Also, the first floor windows are usually very large and often without any window shades. The Dutch don’t mind people looking in the front windows. 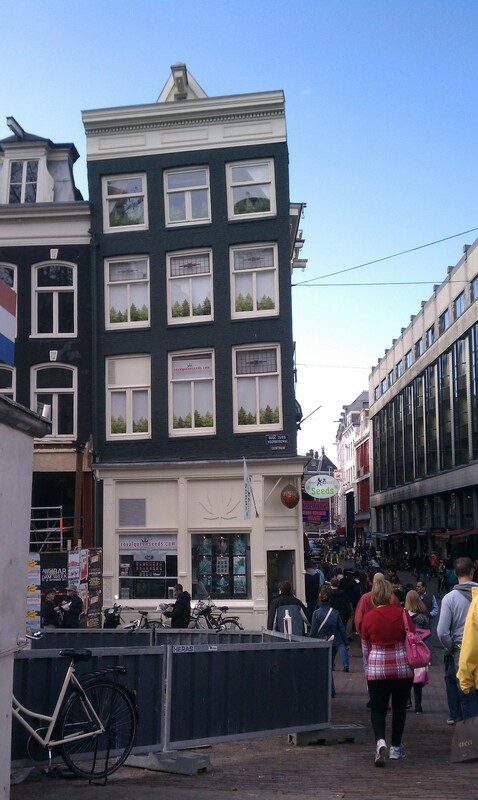 This street is fairly narrow and notice how the building scale – 3 stories – matches that width nicely. 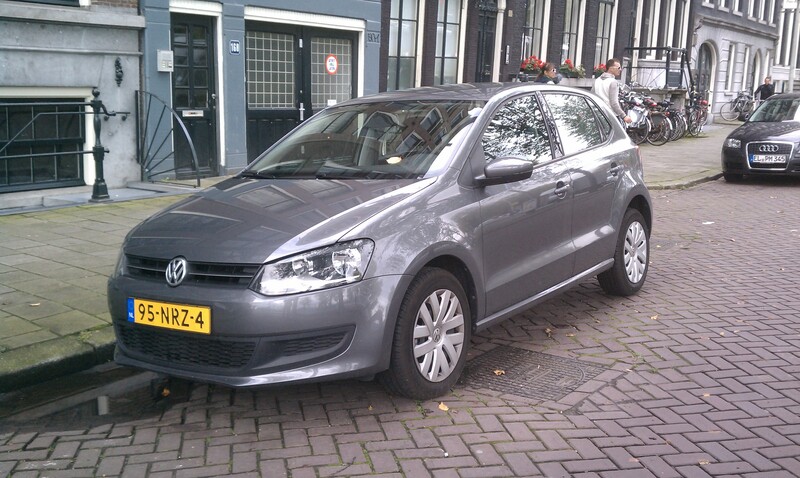 This little car is a VW Polo. I am something of a gearhead, and following transportation design is a passion. Why a picture of an ordinary little Euro car? This would be a perfect car for the United States, and I am confounded why VW does not bring it over to us. This with a small TDI motor would get over 60mpg and has all the utility – if not the size – of an SUV. It should be noted that, even with a marathon happening right behind me (many hundreds of people everywhere), there were no parking snags and in fact, no traffic at all and many empty spots on every street. 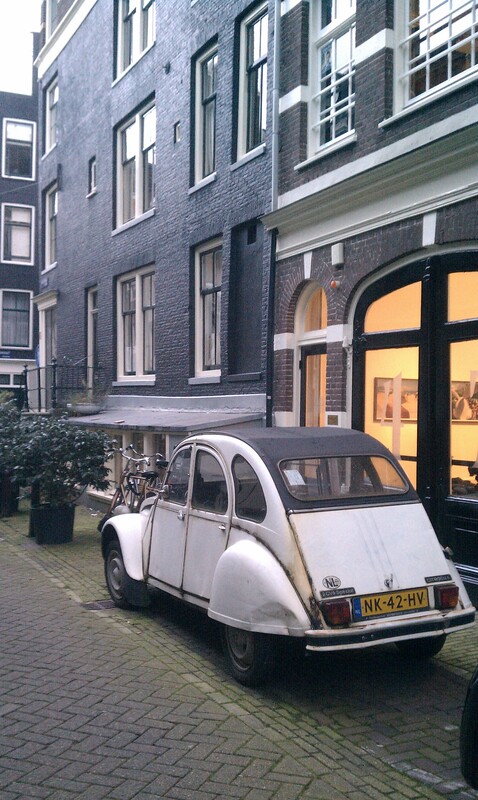 There really is little need to have a car in A’dam. 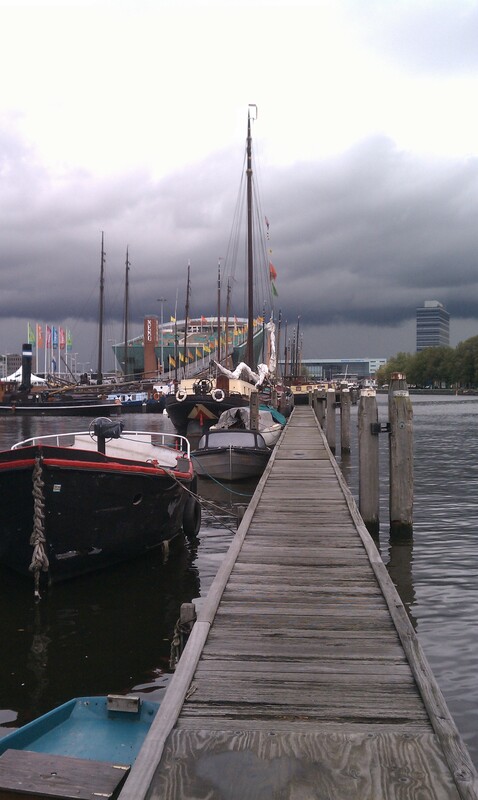 I walked around the harbor with the rain clouds looming. Filling the harbor are all sizes of old boats in all descriptions. 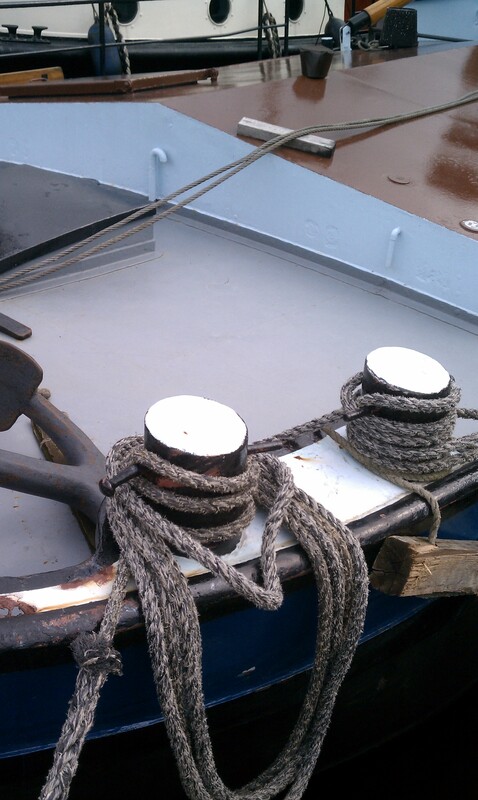 Many seem to be antiques on display, but many interesting, quirky boats seem to be residences and private launches. There is an incredible connection to the water in A’dam. These docks seemed to be public, and I just wandered about. That large “ship” in the background is Nemo, a large science center designed by Renzo Piano. I didn’t go in, but I did go up top and have a view of the city and the marathon. 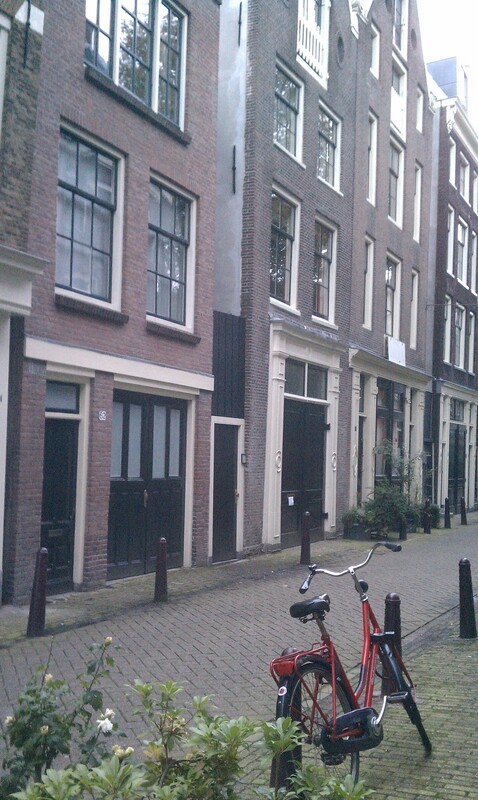 One of the best things about walking A’dam is the mix of architectural styles and eras. The Dutch are very adventurous with modern/contemporary design – some of the best design in the past 20 years has been from Holland. There are many interesting public buildings around central A’dam with daring glass curtain walls, thin steel spandrels, acute angles, exciting colors. 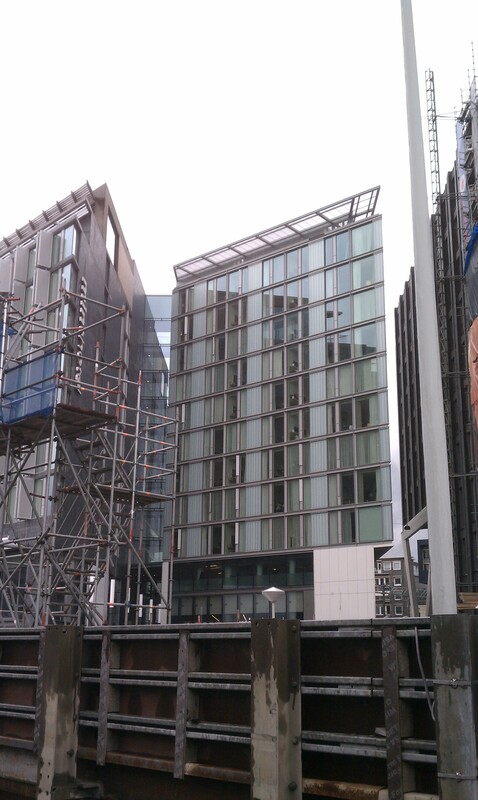 This hotel and apartment structure was going up across a small bridge from Nemo. There is a huge amount of construction on the dock sides and piers near the central rail station. In the years since I have been visiting – about 5 or 6 – this seems to be an ongoing project. Although I would not call A’dam “trashy”, inevitably you get a peek of nature and some of the uglier side to human development. 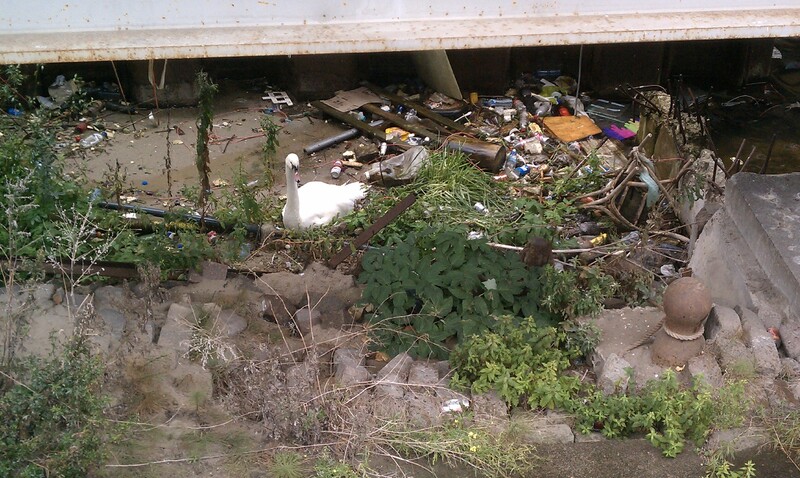 Space is at a premium here, so even this white swan has to squeeze into whatever space she can find. A more cheerful harbor scene; the main train station – Amsterdam Centraal – is the large building in the background. Without too much time to spend, I went off to lunch and to have a few local beers. I paused to snap this lovely, tilting building. 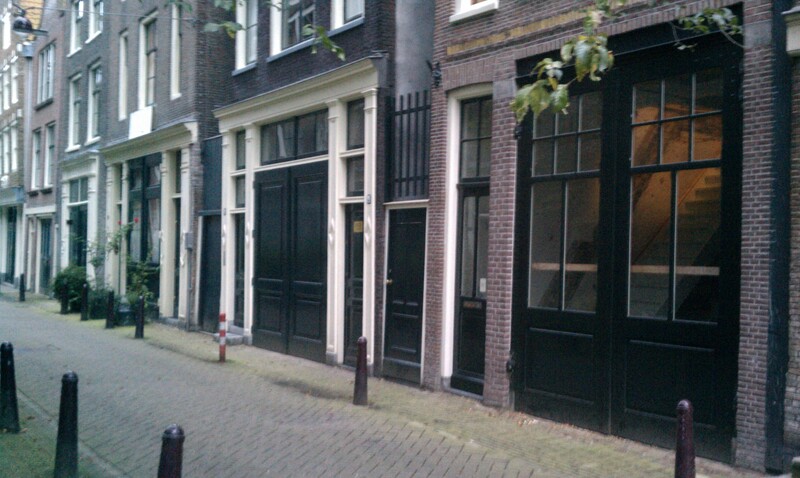 Many, many buildings in the “medieval quarter” of central A’dam lean in every-which-way. 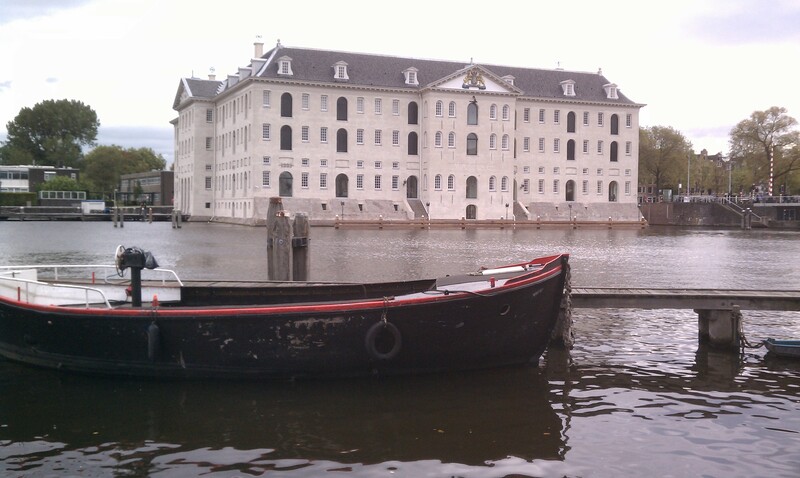 Many of these buildings are from the 1600’s or earlier, and some settling in this water-logged city should be expected. The ever-present forward lean of many buildings, however, was entirely planned. The attic loft was a prominent storage area, with a pulley system installed to haul goods up to the top. The lean of the building allowed large bundles of material and goods to clear the lower floors as it was hoisted up. I went to Germany later that afternoon on the Deutsche Bahn ICE train, but would return to A’dam on the leg back. I usually stay in the medieval quarter on the Herrengracht – the “gentleman’s canal”, a quiet and lovely respite before heading home. 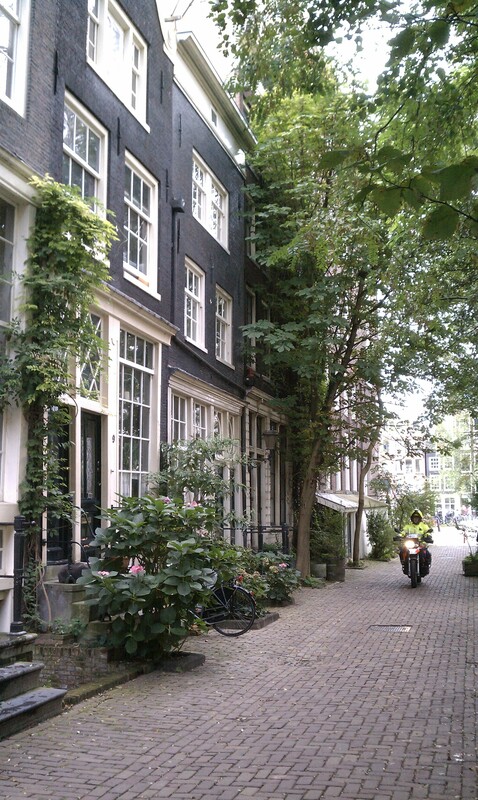 On the morning of my flight I walked up Langestraat – “longstreet”, once of my favorite little walks. Unlike the canal streets, there is usually not a lot of street parking on these side roads. Instead, there is a very rich fabric of old, smaller utility buildings and residences. The sidewalk is usually very small and sometimes non-existent. There are usually bollards to prevent parking and blocking in the double-wide front doors of small garages. Combined with the lush plantings and little traffic, these side streets are an idyllic masterpiece of urban living. One of these buildings would make a great studio/residence for Mick Design. Of course, peering into the windows reveal many design studios, small shops, craftsmen’s workrooms and free-living apartments. 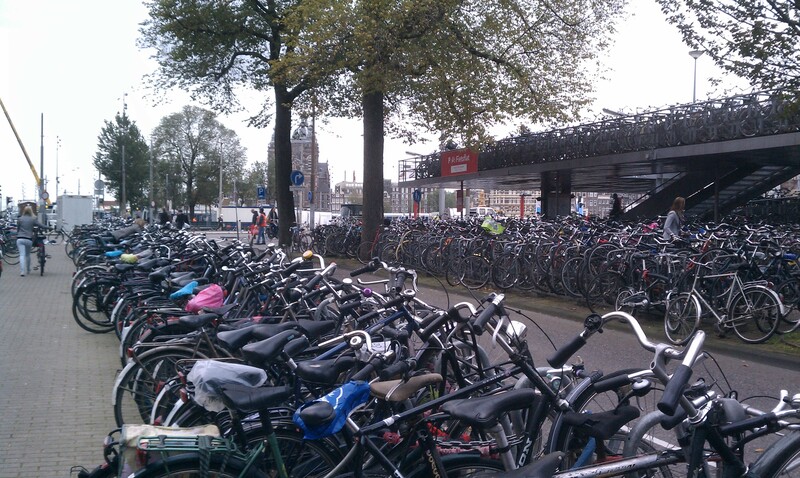 In front of Amsterdam Centraal is the most incredible amount of bicycle parking. Since I was up walking at about 7am, I was in the middle of bicycle rush hour. It seems like everybody commutes on bike here – young, old, parents with children and shopping bags in baskets. This is the multi-level bicycle parking deck in front of the station. 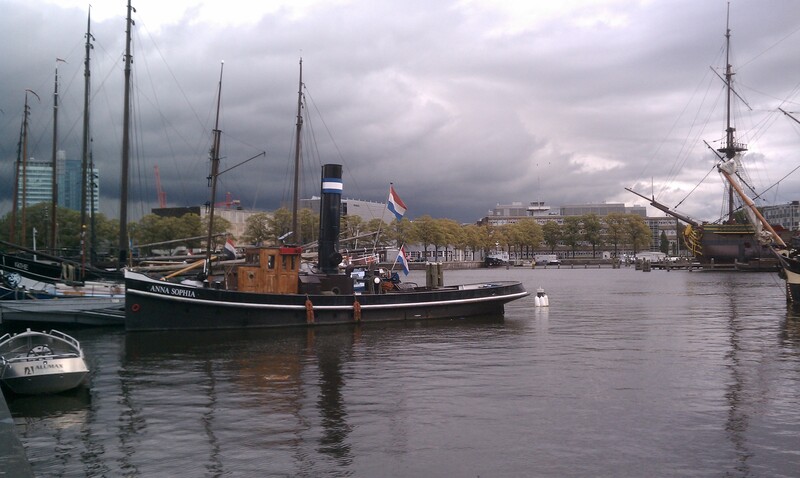 I would like to get back to the city soon, and also explore a bit more of Holland as well. Next post will be highlights from SieMatic’s 2011 Haus Fair, and a special side trip to Wuppertal Germany, where I ride the 110-year old suspended monorail, Die Schwebenbahn. This entry was posted in Amsterdam, SieMatic, Urban Fabric and tagged Amsterdam, Herrenstraat, Langestraat, SieMatic, Urban Walks by Mick Ricereto Interior Product Design. Bookmark the permalink.